Sravasti in Uttar Pradesh was one of the six largest cities in India during the times of Gautam Buddha. The city finds mention in the epic Mahabharata and is believed to have been named after the legendary king Shravasta. However, Buddhist legend has it that it took its name from sage Savattha who lived there. The Jetavana Monastery was one of the main Buddhist monasteries in ancient times. It was the second monastery dedicated to Gautam Buddha and was used to spread knowledge about the religion and his teachings. It was the main place where Gautam Buddha gave his sermons. Several Buddhists visit the old centre to view the remains and pay their tributes. Presently it is a historical park that is well maintained and peaceful. Maheth is a popular Buddhist shrine located in Sravasti. According to history, Maheth was the actual site of the ancient city of Sravasti. The site is a peaceful area that holds ancient ruins of old stupas and Buddhist shrines. The site was neglected for several years. It is only in the 20th century that excavations revealed its rich past and glory. Several ancient findings speak of the city's rich past and heritage. Maheth is also home to the old Shobanath Temple. The Anathapindika Stupa is a beautiful stupa built by one of the leading disciples of Buddha. The literal meaning of this ancient stupa is 'one who feeds the helpless'. Today, the stupa lies in ruins, but its magnificent carvings and architecture draw attention from both historians and tourists. It is believed that Lord Buddha visited Sravasti at the invitation of Anathapindika, whom he had met in Rajagaha. The Anathapindika stupa is said to have been built by him to commemorate the event. 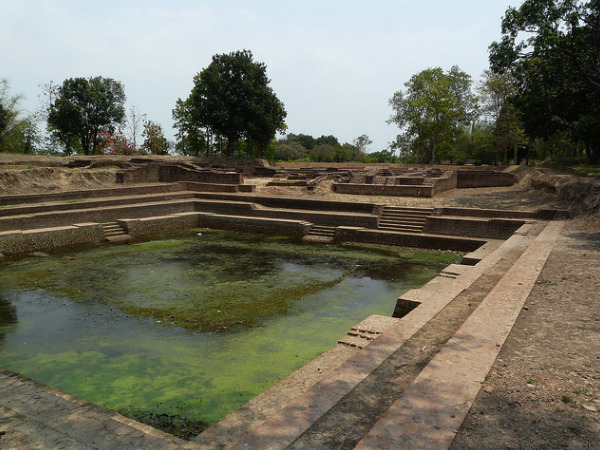 Saheth is located at the heart of Sravasti and is frequently visited by staunch Buddhists. It is famous for the vast cluster of Buddhist shrines. This site has also found frequent mention in various Hindu texts. Saheth was a prosperous centre of learning, training and worship in the ancient days although it was neglected for several years during medieval times. When historians and excavators realized that this site was the original place of the Jetavana Monastery, it became a major pilgrimage place for the Buddhists. Presently, the large area is mostly in ruins but is still visited by tourists and Buddhists regularly. A cluster of shrines comprising monasteries and stupa were also excavated. While the stupas belonged to the Kushana period, the temples were built during the Gupta period. By Air: The nearest airport is the Lucknow Airport that receives flights from cities such as Delhi, Mumbai, Chennai, Agra, and Bangalore. By Rail: There are two options to reach Sravasti by rail. One is from Balrampur, which has a small station which is served by several trains. The second and the convenient option is the station at Gonda that is connected to major cities such as Delhi, Lucknow, Ahmadabad, Bangalore, Kolkata and Agra. By Road: The city is served by private carriers and state transport buses from major cities in the state including Lucknow, Varanasi and Sarnath. So when are you heading to this ancient city?